Written for attention deficit hyperactivity disorder (ADHD) sufferers yet useful for anyone wishing make better use of their time, this book is abundant with effective strategies for combating problems related to inattention, procrastination, disorganization, mismanagement of time, and poor planning. It begins by carefully explaining the neurologic underpinnings of ADHD and focusing on specific executive functions—the brain-based processes that assist in planning, initiating, and carrying out tasks to complete projects. Then using exercises designed to identify areas that need addressing, it aims to "tune up" these executive functions for maximum productivity. 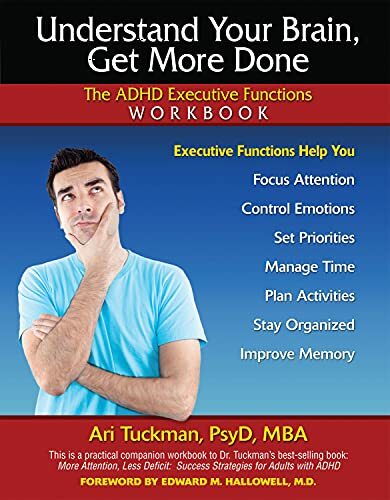 In contrast to many books on ADHD, which can have good ideas but lack practical ways to apply them in everyday life, this guide includes specific recommendations for improving distractibility, working memory, attention, organization, time management, and response inhibition deficits. With strategies based in the science of how the ADHD brain processes information, this reference bridges the gap between knowledge and action. Ari Tuckman, PsyD, MBA, is a psychologist who specializes in the diagnosis and treatment of ADHD. He is the vice president of the Attention Deficit Disorder Association. His previous books include Integrative Treatment for Adult ADHD: A Practical, Easy-to-Use Guide for Clinicians and More Attention, Less Deficit: Success Strategies for Adults with ADHD. He lives in West Chester, Pennsylvania.